A bright green comet is about to come into view for sky watchers in the northern hemisphere. The icy space rock, dubbed Comet Linear, will emerge from next week and be around 100 times brighter than astronomers had expected. Sky gazers in the southern hemisphere, were treated to view of the comet earlier this week, after it passed Earth at 3.3 million miles away. Go to an area with low light pollution away from any cities or towns. The comet is moving between the constellations Sagittarius and Scorpius. This is in the southern part of the sky. The planets Saturn and Mars are in this part of the sky as well. They and the bright star Antares will be the first things you notice, forming a distinctive triangle a little smaller. The comet is climbing to the left of this trio. You may need the help of binoculars, as the moon light will could obscure your view. Currently, Comet Linear is moving rapidly into view from the northern hemisphere. But due to moon-filled skies, you may need binoculars to get a good view. Sky watchers will need to be out at least 1.5 hours before sunrise, in a location as free from light pollution as possible. The comet is moving between the constellations Sagittarius and Scorpius, which is in the southern part of the sky before dawn. Each morning the comet will be higher up with respect to the surrounding stars. They and the bright star Antares will be the first things you notice, forming a distinctive triangle a little smaller than your clenched fist held at arm’s length, according to Sky & Telescope. ‘Don’t expect Comet Linear to be obvious with a long tail,’ explains Sky & Telescope Senior Editor Kelly Beatty. Comet Linear has a greenish colour caused by molecules of diatomic carbon that are fluorescing in sunlight. However, the green tint likely won’t be evident unless you view the comet through a telescope. Given the comet’s unexpected surge, astronomers aren’t sure how long it will remain. 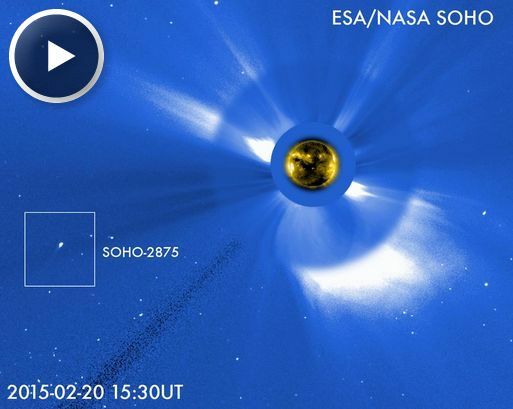 Unofficially, the icy visitor is being called “SOHO-2875,” because it is SOHO’s 2,875th comet discovery. Most comets that SOHO sees belong to the Kreutz family. Kreutz sungrazers are fragments from the breakup of a single giant comet many centuries ago. They get their name from 19th century German astronomer Heinrich Kreutz, who studied them in detail. SOHO-2875, however, is not one of those fragments. What astronomical phenomena will be observable to people in different parts of the Earth this year? 2014 will be saturated with celestial events in respect of comets and asteroids, but less intense and interesting in respect of eclipses. First on the list is a lunar eclipse which will occur on April 15 and will last 1 hour 19 minutes. Only the inhabitants of North and South America will be able to see the complete eclipse. In 2 weeks after that, on April 29, a partial solar eclipse will take place when the Moon will cover the sun only partially. The eclipse will reach its maximum phase in Antarctica and will be observable to the inhabitants of Australia and Tasmania. The eclipse will last only 6 minutes. The next eclipse will be a full moon, which will take place on October 8. This time, the eclipse will be seen to the inhabitants of North America, the eastern part of Russia, Australia, New Zealand and some other Pacific islands. This eclipse is interesting because during the total phase the Moon will cover Uranus. Last eclipse of the list is a partial solar eclipse, which will happen on October 23 and will be visible in North America and eastern Russia. The brightest asteroid of this year will be Vesta, one of the largest asteroids in the main asteroid belt. Its brightness is expected to peak in April when it will be visible with the naked eye. The second brightest asteroid will be Pallas, which is larger than Vesta and ranks first in size among all the asteroids in the main asteroid belt. Pallas will be seen later this month. Among the other most interesting asteroids, Hebe and Juno are worth noting. Some sources mistakenly attributed Ceres to the asteroids and included it in the list above. However, Ceres had been considered an asteroid till August 24, 2006, when it was classified as a dwarf planet. The bigger an asteroid is, the more sunlight it reflects. However, the brightness of an asteroid is heavily dependent on the albedo (reflectivity characteristics of its surface), which in turn is determined by the composition of its constituent species. For example, the asteroid Vesta reflects 4 times more light than the dwarf planet Ceres because of the high albedo of the surface and is the most visible asteroid in the sky, which often can be seen even with the naked eye. The brightest comets will be 154P (P/Brewington), C/2011 W3 (Lovejoy), C/2012 X1 (LINEAR), C/2012 K1 (PanSTARRS) and C/2013 A1 (McNaught). The list may vary depending on the expected increase in brightness and the discovery of new comets. MESSENGER was designed to study Mercury, not comets, “but it is a capable spacecraft with a versatile instrument package,” he adds. “We hope to get some great data.” Onboard spectrometers will analyze the chemical makeup of the two comets while MESSENGER’s cameras snap pictures of atmospheres, jets and tails. Comet ISON is already a media favorite. Astronomers have been tracking it since Sept. 2012 when it was discovered on a trajectory that would take it perilously close to the sun. On Nov. 28th of 2013, Thanksgiving Day in the USA, Comet ISON will pass through the sun’s atmosphere little more than a million kilometers above the sun’s fiery surface. If the icy comet survives, it could emerge as a beautiful naked-eye object for observers in the northern hemisphere. MESSENGER’s glimpse of Comet ISON as it plunges inward could give astronomers the data they need to predict the comet’s fate. Comet Encke is less well known, but no less interesting. For one thing, it is the source of the Taurid meteor shower, a slow display of midnight fireballs that occurs every year in early- to mid-November. Comet Encke dips inside the orbit of Mercury every 3.3 years, so it is regularly exposed to solar activity. In 2007, NASA’s STEREO spacecraft watched as a solar storm ripped off Encke’s tail–which promptly grew back: movie. Ironically, the fact that MESSENGER is designed to study a rocky planet could prove advantageous for the icy comets. MESSENGER’s x-ray spectrometer, in particular, could detect signs of ‘comet dirt’. 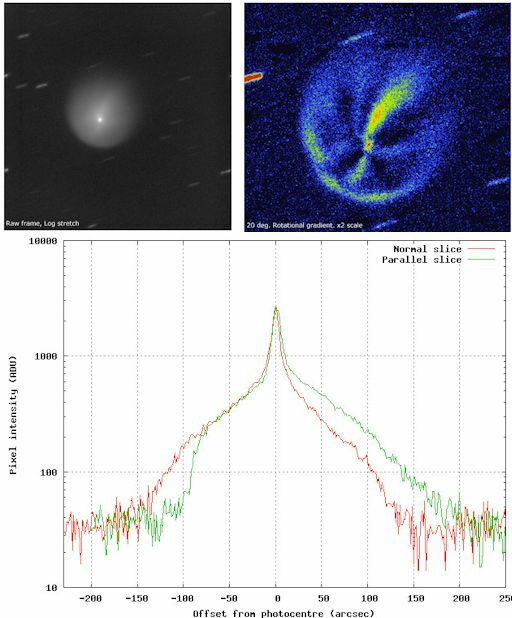 Another set of images taken by James shows the comet’s atmosphere or “coma” expanding over a period of two days. “The coma’s diameter is increasing at a rate of 30 arcseconds per day,” says James. “At a distance of 2.95 AU this corresponds to 65,000 km/day or a little less than 1 km/s.” He made these observations using an 11-inch Celestron telescope. Located in the constellation Coma Berenices, Comet LINEAR X1 rises in the east about an hour before the sun. The low altitude of the comet in morning twilight is a challenge, but because the comet is fairly bright, magnitude +8.5, it is still a relatively easy target for backyard telescopes equipped with digital cameras. Monitoring is encouraged! Resources: 3D orbit, ephemeris, sky map. What is the Strange LIght in the Western Sky? For the past week or longer, there has been a strange, glowing UFO in the horizon of the western sky and according to SkEye and Stellarium, there are no stars or planets in that area. If you are looking at the western sky in the early evening, you will see Arcturus glowing as well as Venus. You will also see a light to the left of Arcturus that is not defined by the skymap, SkEye. You will see this bright light in the early evening in the western sky. SkEye is a free app for your cell phone that maps out the sky for you. 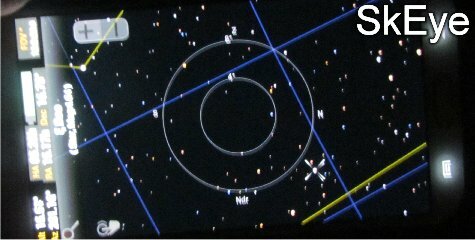 With this app, you can see every known star, planet and constellation. Similar to Venus, this light is not seen very high above the ecliptic plane of earth’s orbit. While zooming in on it with my Canon 35x Powershot, the light would change from red to green to white. 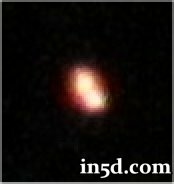 Even with a tripod, I had difficulty zooming in and focusing in on it but I will continue trying to get empirical video and photos of this anomaly. My particular sighting came from the Gulf Coast of Florida but this sighting has also been reported from coast to coast in the United States as well as all around the world. Speculation has inferred that this could possibly be a very large comet or possibly an extraterrestrial mothership. 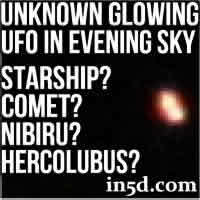 It may even possibly be Hercolubus or Nibiru. Carlos Muñoz Ferrada is an world renown astronomer who recently stated that Hercolubus will be making a visit near our planet. At this point in time, it is unsure of the angle and trajectory of Hercolubus but it is said to have wiped out Atlantis and had caused the “great flood” in many religious texts. If this light is a starship or mothership, it is of massive proportions for it to be bright enough to be seen with the naked eye. If you know what this bright light may possibly be, then please comment below. Also, if you are able to take any pictures or videos, then please let me know and I’ll add them to this article. If you have seen this anomaly, please comment below and tell us the state or country you live in. Thank you! This stunning space wallpaper is a NASA Hubble Space Telescope image of Comet C/2012 S1 (ISON) when the comet was slightly closer than Jupiter’s orbit at a distance of 386 million miles (621 million km) from the sun. As long as ISON is a fairly typical comet — one with “normal” size, density and rotational characteristics — it probably won’t disintegrate during its upcoming flyby, which will bring the icy wanderer within just 730,000 miles (1.2 million kilometers) of the sun’s surface on Nov. 28, researchers report. 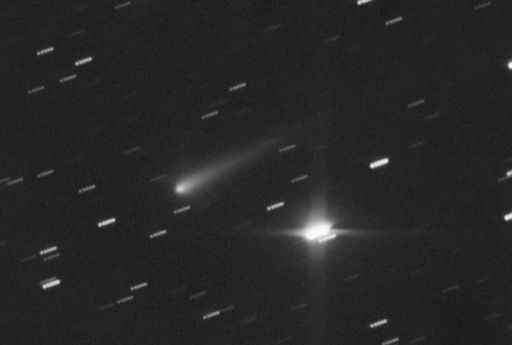 In the new study, Matthew Knight of the Lowell Observatory in Flagstaff, Ariz., and Kevin Walsh of the Southwest Research Institute in San Antonio conducted simulations of Comet ISON’s upcoming solar approach, then put the results in context by looking at how other “sungrazing” comets have performed during their encounters with our star. it’s spinning, and in which direction), researchers said. Comets less than about 0.12 miles wide (0.2 kilometers) face destruction by the sun’s heat, which can evaporate off all of their ices. But scientists think ISON is big enough to deal with this issue; most estimates place the comet’s core between 0.12 miles and 1.2 miles across (0.2 to 2 km). None of this is set in stone, of course, since most of the key characteristics — including Comet ISON’s exact size, density and spin — remain unknown. And it’s notoriously difficult to predict the behavior of comets, especially “dynamically new” ones like ISON making their first trip to the inner solar system from the distant, frigid Oort Cloud. “Whether or not disruption occurs, the largest remnant must be big enough to survive subsequent mass loss due to evaporation for Comet ISON to remain a viable comet well after perihelion,” Knight said in a statement. Meanwhile, another new study suggests that Comet ISON might exhibit a burst of activity a week before its close solar encounter. Researchers used NASA’s Hubble Space Telescope to measure the rotational pole of ISON’s core and determined that only one side of the comet is being heated thus far as it streaks toward the sun. But that should change on or around Nov. 21, when Comet ISON ducks inside the orbit of Mercury, the solar system’s innermost planet, team members said. , Ariz., said in a statement. Both studies were presented today (Oct. 9) at the American Astronomical Society’s Division for Planetary Sciences 45th annual meeting in Denver. At the moment, ISON is too dim for the naked eye–“I estimate the comet’s magnitude to be +12.5,” says Schur–but it is on track to become an impressive sungrazer. For comparison, Comet ISON is brighter than Comet Lovejoy was in 2011 at a similar distance from the sun. The fact that Comet Lovejoy turned into a spectacular sungrazer bodes well for the performance of Comet ISON. Observers of Comet ISON will notice that it is in the same part of the sky as Mars. The comet will make a close approach to the Red Planet on October 1st, and during that time Mars satellites will be taking ISON’s picture at point blank range. Those images will likely rival or improve upon the view from Earth.